The University of Abuja chapter of Academic Staff Union of Universities (ASUU) started a two-week warning strike on Monday over the failure of government to implement a visitation panel report. Dr Clement Chup, the Chairman, University of Abuja branch of ASUU, who disclosed this at a press conference, said Federal Government’s delay in implementing the white paper was not in the interest of the university. He said the union’s resolution to embark on a two-week warning strike followed government’s failure to listen to the university’s longstanding complaints over governance crisis at the institution. According to him, the specific element of the crisis is the continuing delay in the implementation of the recommendations of the report of the 2012 Presidential Visitation Panel. Chup said the implementation of the report would no doubt commence the needed cleansing and rebuilding that would bring lasting solution to the crisis in the university. 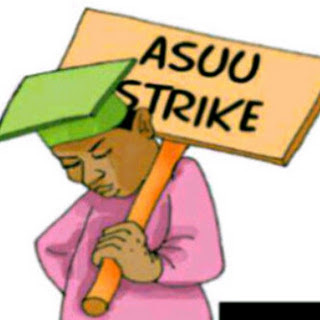 “In view of the deliberate delay of government to commence implementation of the Dr T. C. Osanakpo Report, eight months after submission, ASUU, University of Abuja chapter, has no option but to embark on a two-week warning strike. “The Special Visitation Panel has carefully and painfully after eight weeks of work come up with a report that left no one in doubt of the near collapse of the system. “We understand that almost N400million of tax payers’ money was expended on the panel and that the panel submitted its report to government on 21, September 2012,” he said. In his reaction, Dr Mohammed Damagum, the Chairman, ASUU Integrity Group, University of Abuja, condemned the warning strike, saying members of his group should ignore the action. He said the call for the strike was unscrupulous, unpatriotic, maliciously calculated and ill-conceived to destabilise the hard-earned peace in the university. The group chairman called for support for the newly constituted university governing council, adding that the strike was not in the interest of the university.